In recent times, numerous researchers and educators have been exploring playful learning with digital games in both formal and informal contexts. 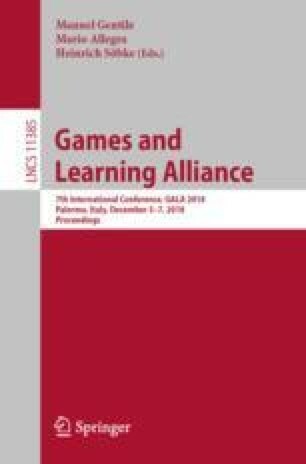 This study explores the point of view of players on the relationship between digital games and learning, based on a set of semi-structured interviews and two workshops involving relevant stakeholder groups (players, teachers, trainee teachers, and parents). Analysis of the gathered qualitative and quantitative data reveals that both players and educators agree that games have educational potential, but the assumption of blanket learner enthusiasm for game based learning is not always accurate. In particular, players have some resistance towards serious games, which are seen as less appealing than “real” videogames. In addition, some players and some teachers feel that the use of games in formal learning contexts contradicts the fundamental freedom intrinsic to the act of playing. Players are aware of the risks video-gaming presents, but they do not appear to be fully aware of its learning potential, as most mention lower order skills (memory, attention, reaction time) rather than academic knowledge and soft skills. Some mention game potential for the development of their social, cultural and gender identity, with consequential positive effects on their ethical beliefs. Players also point out the importance of videogame education for teachers, parents and for themselves. Lastly, they feel the need for innovation in games that, through innovative game mechanics and narratives, enhances the cultural and artistic component of games. Open image in new window The Gaming Horizon project has received funding from the European Union’s Horizon 2020 research and innovation programme under grant agreement No 732332.